It’s only been a week since we beat the Scots and we’ve had Cheltenham and the Champions League to entertain us in between, but it’s still felt like a long wait until the big one at Twickenham this afternoon. 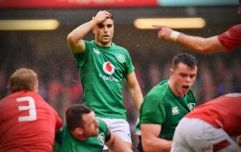 Now, thankfully, it’s over and we can concentrate on Ireland trying to win what would be only our third Grand Slam ever, having previously accomplished the feat in 1948 and 2009. As RTÉ did before them, TV3 do a good job of setting the mood before these types of encounters and they have done it very nicely indeed before this afternoon’s crunch clash, with a mixture of stirring words and archive footage to ensure that viewers are well up for it come kick off. Sure, some of the pronunciations of some of the words have been stretched for the sake of rhyme, but we’re willing to overlook that today; the result is all that counts after all. When Ireland first won the Grand Slam in 1948, results included an 11-10 win over England in Twickenham; Joe Schmidt would bite your hand off for a repeat of that result this afternoon.